The late Chris Kyle is reported to be the most lethal sniper in US military history. He is the subject of a wildly successful and wildly inaccurate biopic by Clint Eastwood. Eastwood depicts him as a typical Eastwood character: a warrior with a conscience. Kyle's own autobiography reveals him to be an unrepentant trigger-happy mass-murderer. I specialize in, among many other topics, the charts of mass-murderers. Such individuals and the charts of mass-murder events display a combination of astrological traits I call the Bloodbath Formula. The formula, in my experience, pretty much always appears in the charts of murderers and mass-murder events; the presence of the formula, however, in no way guarantees such persons or events. Chris Kyle was basically a government-sanctioned serial killer. 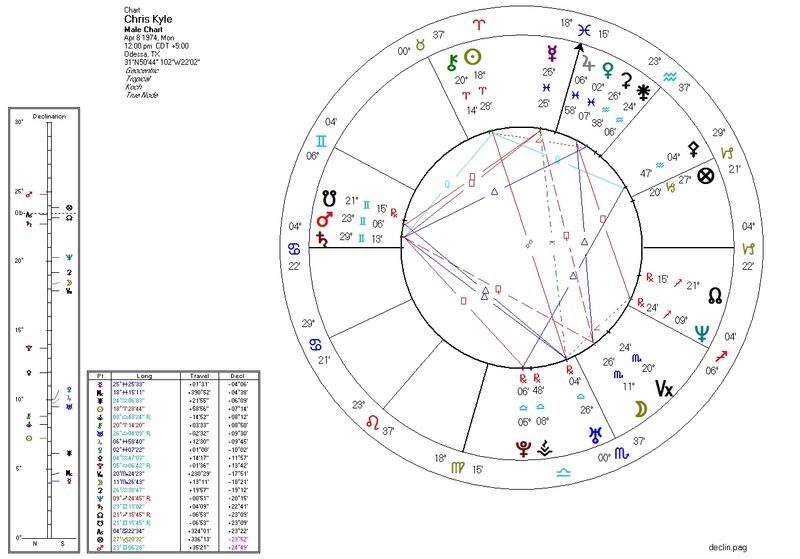 His chart (time unknown) reflects the fact, contrary to the mass-media about him, that he was exactly that. 1. Pallas trine Pluto and co-ruled by Saturn (square Pluto and conjunct South Node) and Uranus (trine South Node). 2. Venus ruled by and square Neptune. 4. Moon ruled by Pluto (regardless of time of birth). The Mars conjunction to the South Node is a poetic touch, representing hidden violence.